Tionna made a soup today using many of the wonderful vegetables from their Birdsong Farm haul. She used potatoes, green beans, kale, and carrots with onion, chicken broth and cream, I believe. She said that L loved it and ate it up, but E was much more fond of the garlic bread that Tionna made and the peaches that she fed them! Tionna also said that she and Benji can’t shovel the food in fast enough, and that L is beginning to use a fork! 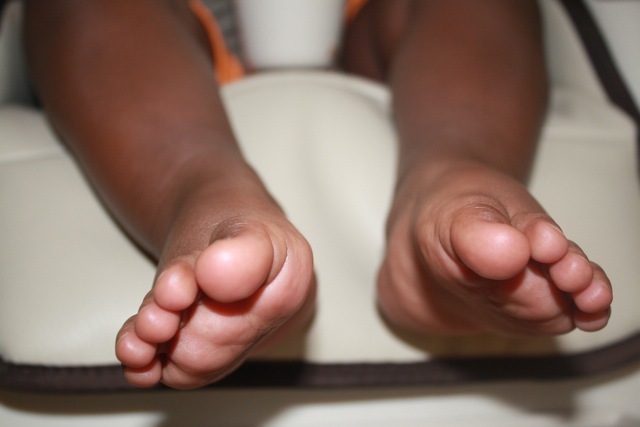 I do not have a photo of the soup, so I will show you one of the baby’s feet at the high chair. They prefer to have bare feet just about anywhere! Who doesn’t? This entry was posted in General on July 19, 2011 by carolyngalizio. Kim and I are the parents here. We've been married a long time and love to be in the kitchen together. Over the years we have become more interested in eating food that is not only delicious, but also healthy and as local as possible. Kim likes to make meat, and I like to make vegetarian dishes . Just what happens at our house! We happen to really love all of the others who write on this blog! I love the bare tootsies!! Agree with that. And look Tom, you are not the only one making soup!